When the British government last week released the report of Lord Justice Leveson's inquiry into abuses in the media, Australian journalists rushed to compare — and mostly conflate — Leveson's recommendations with those of Australia's Finkelstein inquiry. This rankled well-informed readers of both reports, such as Australian Press Council chairman Julian Disney, who pointed out fundamental differences between the two. The blurring of Leveson and Finkelstein in the minds of journalists, publishers and the wider public is, however, an important fact in itself. It is a reminder of the anger that spawned the inquiries, and a broad hint about their likely consequences. Both inquiries came about because of political decisions by governments — arguably a reluctant one in the UK, and arguably an opportunistic one in Australia. In the course of their investigations both accumulated abundant evidence of a reality that the public already knew all too well, and which journalists and publishers almost never acknowledge: that media self-regulation has been a demonstrable failure. Both inquiries have proposed new regulatory regimes that would replace the wrist-slapping penalties of self-regulation with real ones. Neither has proposed anything that remotely resembles censorship or government control of the media, but people who rely solely on media reports for their knowledge of the recommendations can be excused for not knowing that. The Australian media's coverage of Finkelstein, in particular, provides an astonishing case study in distortion, misrepresentation and self-interested pleading. British readers have fared rather better in the coverage of Leveson, perhaps because the abuses that inquiry scrutinised, such as phone-hacking, could not be defended even by those who had systematically perpetrated them, and perhaps because at least some sections of the UK media, notably The Guardian, had been instrumental in uncovering the abuses and calling for the inquiry. For the record, and in extreme summary form, what Leveson and Finkelstein have both recommended is the creation of all-media regulators that would not be effectively controlled by proprietors, which is what has happened under 'self-regulation'. The regulators would be genuinely independent, not under government direction, and there are various mechanisms that could ensure this — Leveson recommends a regulator whose members would be chosen by an appointments panel operating at arms length from the government of the day. The regulators would concern themselves with violations of the relevant codes of conduct; they would have no power to censor the production news or comment. As Leveson pithily observed with regard to the British tabloids, the problem is that they functioned almost as if their own code did not exist. It is a problem that publishers and broadcasters, in the UK and Australia, still do not readily acknowledge. As Disney has noted, there are crucial differences between the two sets of recommendations. 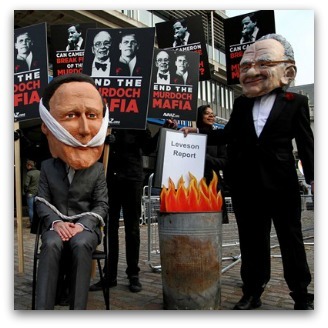 Finkelstein proposed that the regulator should have statutory powers of investigation; Leveson does not. And Leveson offers British media outlets something they have not previously had: a low-cost alternative to civil litigation for those who are willing to sign on to the new system. Whether they'll ever get the chance to do so is extremely dubious, however, and not only because the publishers and broadcasters cannot overcome their instinct to scream 'censorship'. In the UK, Prime Minister David Cameron has said he is reluctant to increase regulation of the media, and in Australia the Finkelstein report has been gathering dust on the desk of Communications Minister Stephen Conroy since the day he received it. The usual explanation for such responses is that governments, of whatever hue, are afraid of incurring the wrath of media proprietors. In Australia that is probably true. The Gillard Government, despite having commissioned Finkelstein in an apparent attempt to profit from the global wave of revulsion at the practices of News Corporation's British subsidiary, probably does not want a head-on confrontation in the lead-up to an election. In Britain, the outcome may yet be different: the Labour opposition says it would implement Leveson's proposals, and the junior partner in the governing coalition, the Liberal Democrats, is inclined to do so, too. The bitter irony, of course, is that global media corporations only possess the power to intimidate governments because governments have allowed them to grow so large. News dominates Australia's metropolitan newspaper market because the Hawke government allowed it to swallow the Herald and Weekly Times group, a decision that initiated a chain of events from which the mainstream media in this country have never recovered. If Julia Gillard and Conroy now feel powerless, it is because of what their Labor predecessor set in motion. Ray Cassin is a former member of the Australian Press Council. Thank you Ray.Headline :"Rupert looks Back to Reality" It seems the most powerful executives and wealthy shareholders don't have "inviolable" rights, as they assumed.Yes,governments let this escalate hoping to gain from foreign investments,and have been happily playing second fiddle to multi nationals.I also wonder about Woolworths and Coles stitching up,'swallowing' our food industry, and entering into gambling.Farmers would say its the same as Rupert Murdoch;s empirical hold on media.Governments have done little to keep a fair market or level playing field.They have not had 'ordinary' every day Australians'(Consumers and Voters) interests in mind at all. We have wealthy chinese landowners now instead of developing our farming practices.Why can't our government fund food production in partnership with Australian companies?Mining companies could be asked to support local businesses/farmers. We are being sold without trying to discuss the future or formulate alternatives.I thought there was a limit to what could be foreign owned? ?We will soon.have another Rupert here. Thank you Ray. You clarified a number of issues for me; I'd been too reliant on the media for information. If a truly independent media regulator were set-up, I'd extend its remit to the ABC. Here complaints (admittedly many of them trivial) are dealt with by the ABC Audience and Consumer Affairs section. It is difficult to ascertain what qualifications staff in this section have to deal with complex issues. Being an Opus Dei fans, Conroy would hardly feel 'powerless' in the face of NewsCorp, the most un-news news organisation in the world, and as for Gillard, well, she supports every bad idea offered to her in the mistaken belief that represents some form of leadership capability. But NewsCorp is not alone in un-news. It has taken the return of Margo KIngston to shine a light on Abbott's 'sluch fund' during the Hanson years, something he has never explained or been called to account for, yet where was the SMH-Age? MIA, along with the entire ABC system, devoid of newshounds as they are and only capable of repetition, mostly of NewsCorp rubbish if one listens to Fran on RN. But then the ABC was neutered when Howard gave it over to be run by a Hillsong type. Who cares about 'enquiries' into newspapers, when the whole idea of them has reached its use by date anyway? What has Opus Dei got to do with all this, Janice? Are you saying that Conroy is a member of Opus Dei? The reference to Hillsong is also unclear. "News dominates Australia's metropolitan newspaper market because the Hawke government allowed it to swallow the Herald and Weekly Times group." Really? People just keep buying News products regardless of current content? What a pack of mindless drones you take us for, Mr Cassin. Here's an alternative view: News "dominates" because by and large it continues to sell products more preferable to consumers than competing products. And perhaps part of the appeal is that its stable is less biased than the head-in-the-sand leftist Fairfax group, for example. Next we'll hear complaints about the Bolt Report "dominating" hapless rivals such as taxpayer-subsidised ABC "Insiders", as if the patent bias of the latter wasn't a significant turn-off. I expect many people who dip into News Ltd "product" will drop off in time because they refuse to "subscribe" to their views. It's one thing to pay $1 or so to buy a printed newspaper and maybe get an idea of what the fascists are up to, but actually "subscribing" is something I would never do. And now that the Weekend Australian has stopped printing the full week's TV guide - even the $3 cover price is not worth it for me anymore.